Welcome to the Shipwreck Arcana. You and your friends are in a drowned world, but if you can correctly predict each other’s fates you just may get out alive. 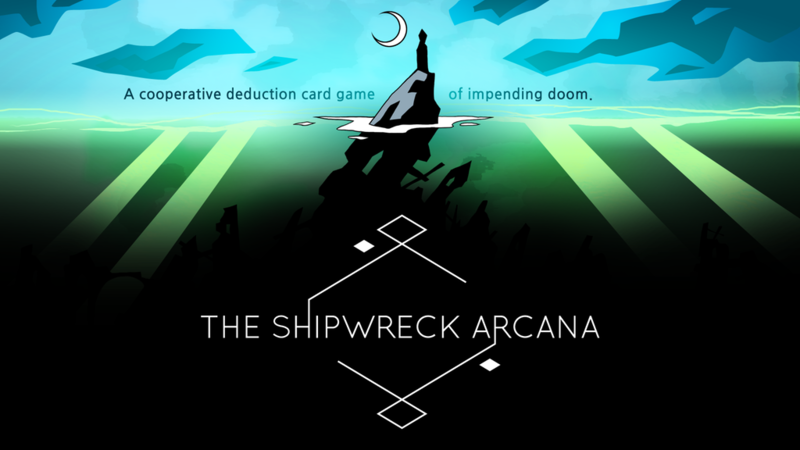 Shipwreck Arcana is a Cooperative Deduction game where you and your team use Logical reasoning and Mystical cards to determine the Hidden Fates of the other players. If you can do it quickly enough, you win. the active player must play one of their Fate tiles onto one of the cards and thereby try to convey as much information as possible to the other players. 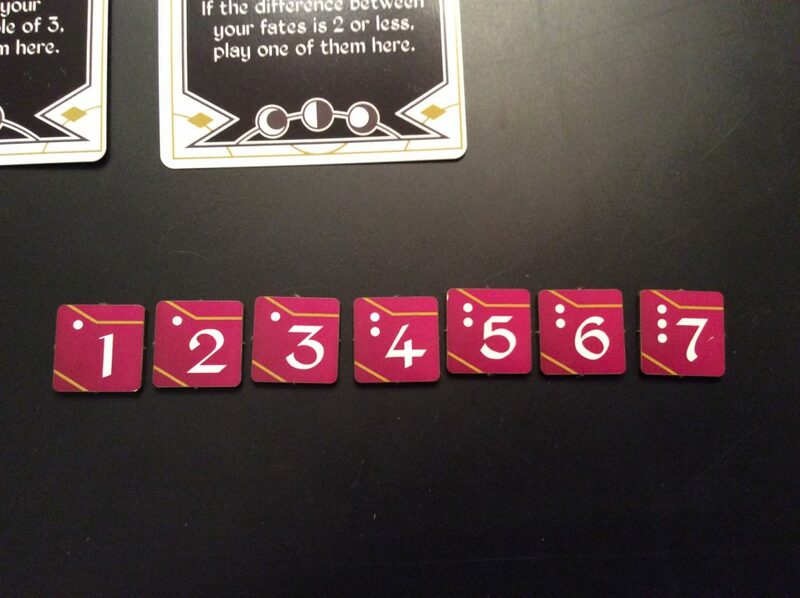 The game comes with markers numbered 1-7 so that the players can keep up with what information they have already been provided from round to round. After a Fate tile has been played, the other players must then decide if they have enough information to guess the active players fate. If not, play passes to the next player. If they do guess and get it right, the “green”token moves closer to winning. If they guess wrong, the active player must discard the Fate tokens they have been working with and get new ones next turn, thereby erasing any progress they have made. 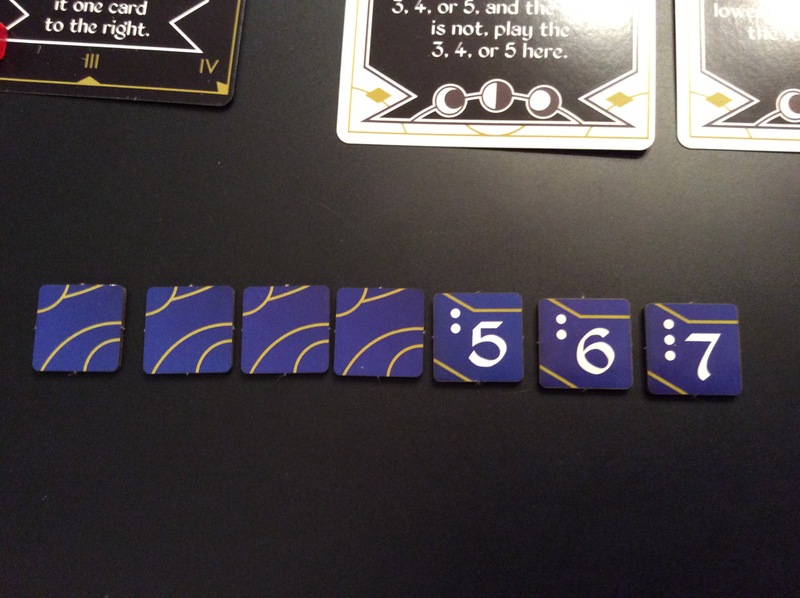 If you cannot play on any if the cards, you play one of your Tiles on the Hours card, which is actually quite a bit of information. The other players can often rule out quite a few possibilities and come closer to guessing your Fate. But…You HAVE to play a fate tile on one of the cards if possible. 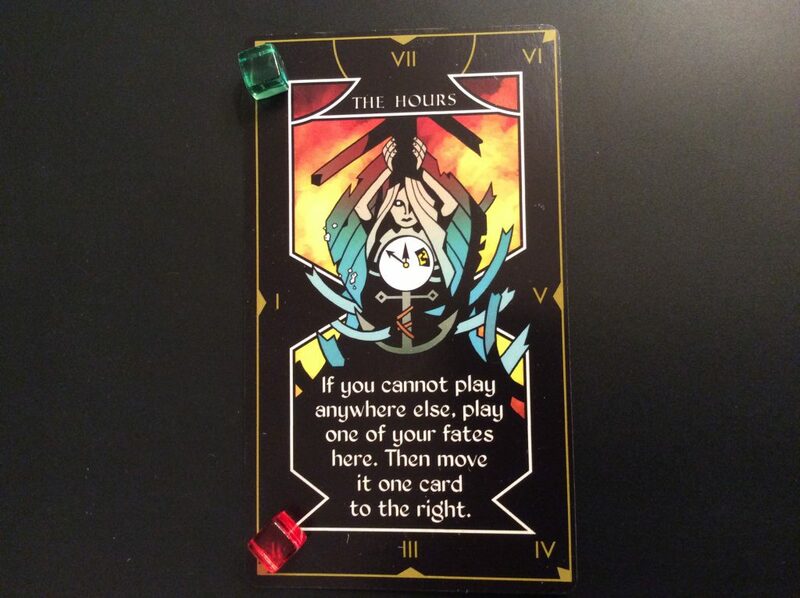 You cannot choose to play on the Hours card UNLESS you cannot play EITHER of your Fate tiles on the other cards. 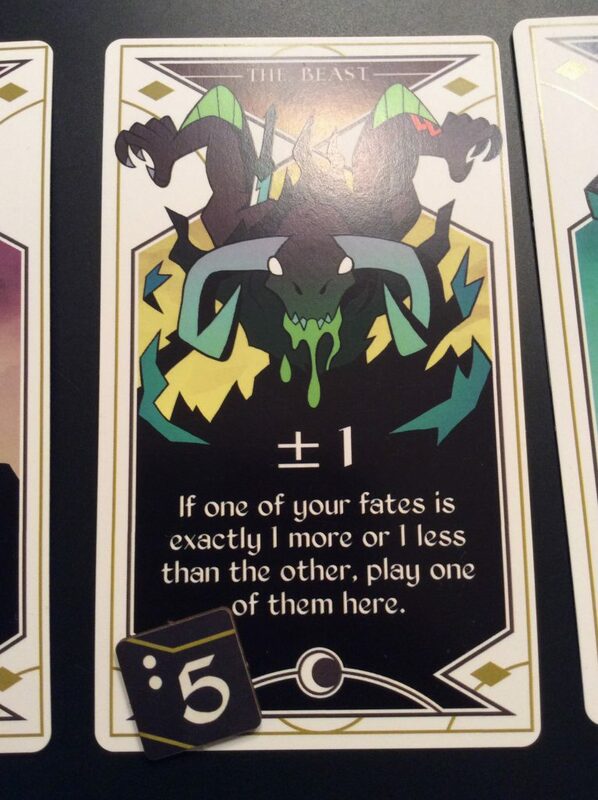 If you cannot play on one of the cards with the new fate tile you drew , you may HAVE to play your fate tile from the previous round thus messing up the information you gave them last round – trying to make this as obvious as possible is great but sometimes you just lead them down the wrong path. Sometimes this cannot be avoided, but remember – the active player cannot talk at all, so you can’t plead your case, you simply play a tile and hope they understand. To make sure that the game is progressing and that it doesn’t become stale, the cards all have a “time limit” on them. 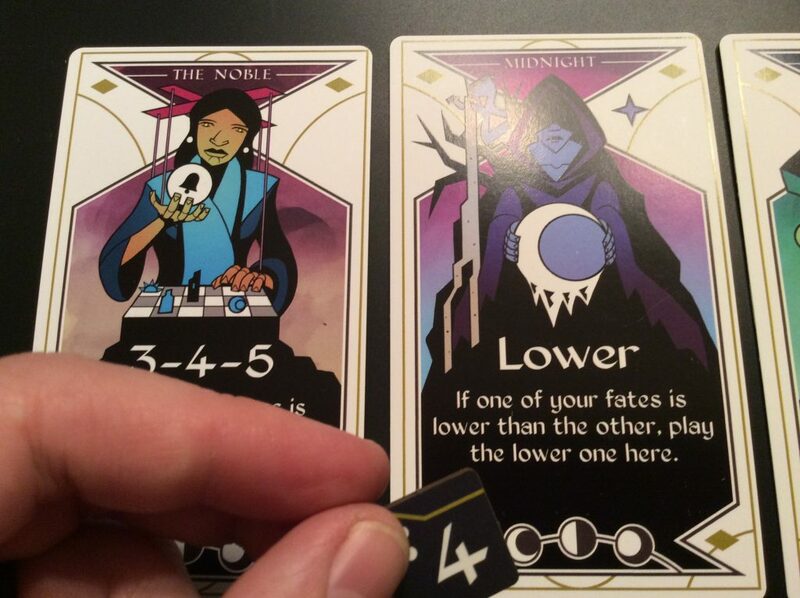 Each card has a number of moon symbols on the bottom of the card. 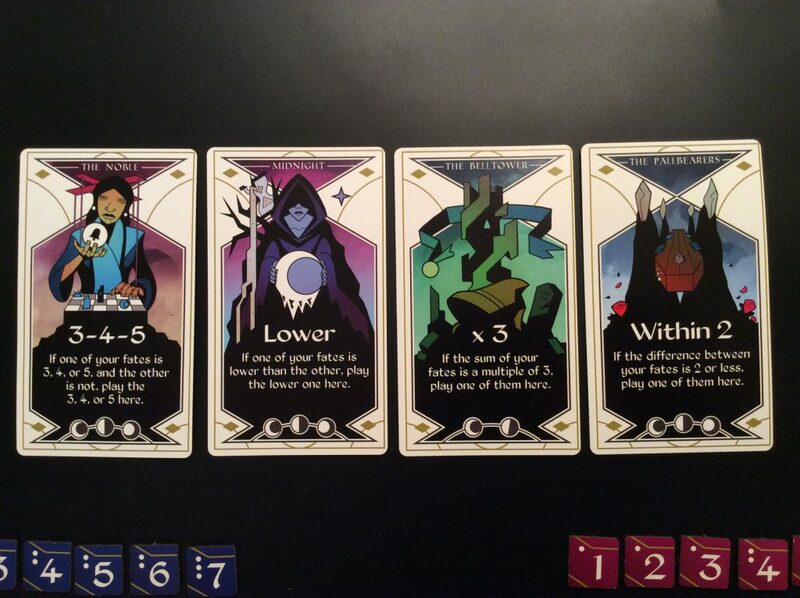 These correspond to the tiny symbols on the fate tokens. Once you have played a Fate token on a card, you count up all of the dots on all of the Fate tokens on that card. If they are equal to or more than the number of Moons, the card Fades. It is removed from play, the Fate tokens go back in the bag, and the Doom tracker moves closer to a Loss. Luckily, when a card Fades, it is flipped over and a special power is revealed for the Team to use later. If a card Fades on the same turn that a Fate token was correctly identified, the Doom token does not move. Each time you play the game, the combination of cards that come out will change the logic and deduction of the game. You are always trying to play your Token on the card that will provide the most information to the other players, but sometimes where you don’t play your tiles is just as important as where you do. 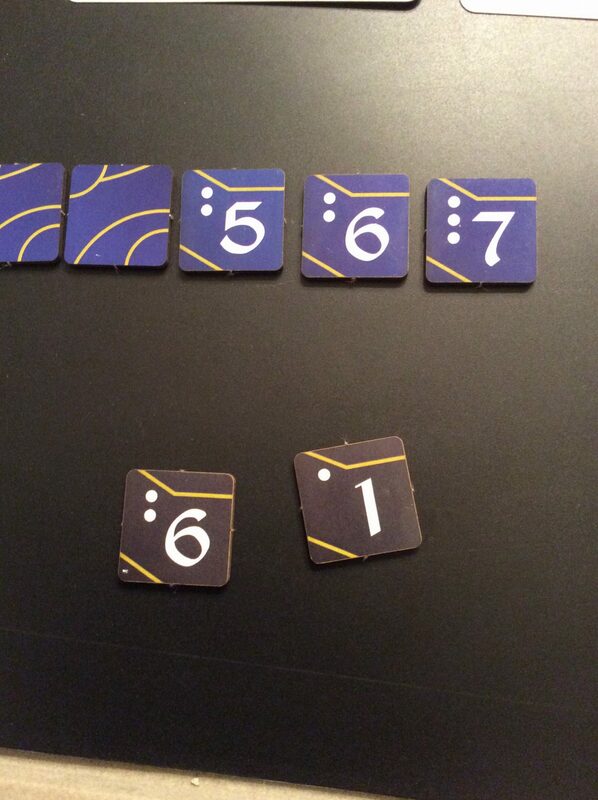 For Example: by not playing on the Engine card you can tell your teammates that your tile is not a double or triple of another number which could clue your them into new information. First turn, I pull a 4 and a 6 from the bag. 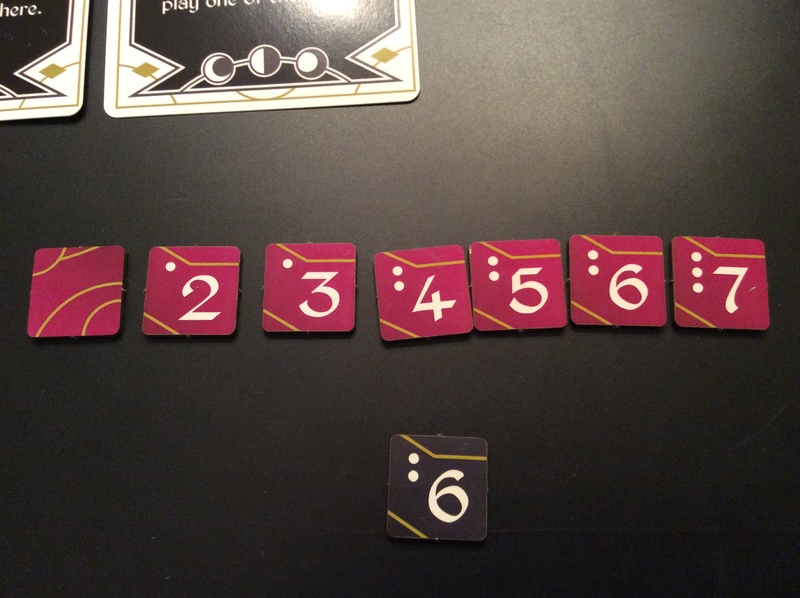 I could play the 4 on the Noble because it is a 3, 4, 5 and the other is not – this would tell my team that my number is not a 3, 4 or 5 . I can actually tell them that my fate has to be a 5 or higher thus 1 extra possibility is eliminated . The next player draws a 1 and a 6.
which is unfortunate because it only rules out 1 possibility. 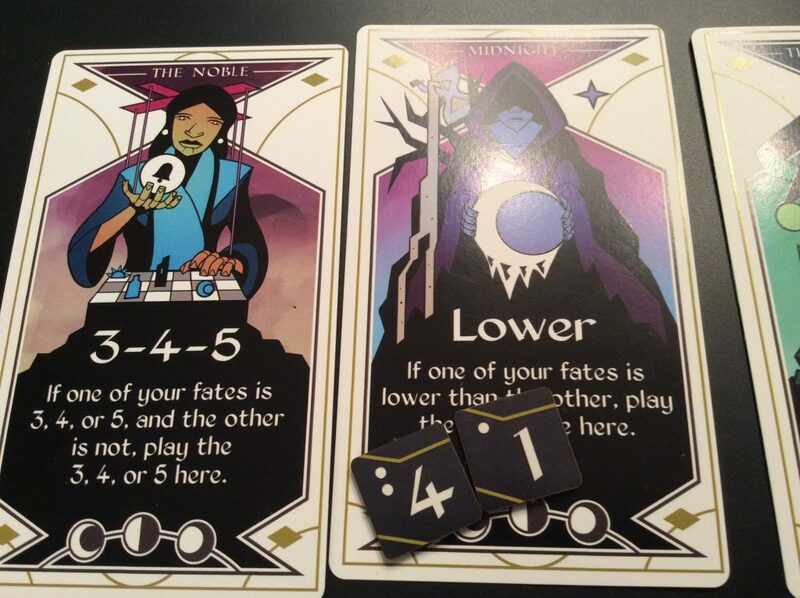 The Midnight card flips and becomes a special card we can use later for our benefit. Back to the first player: We draw a new fate Token and it is a 1. 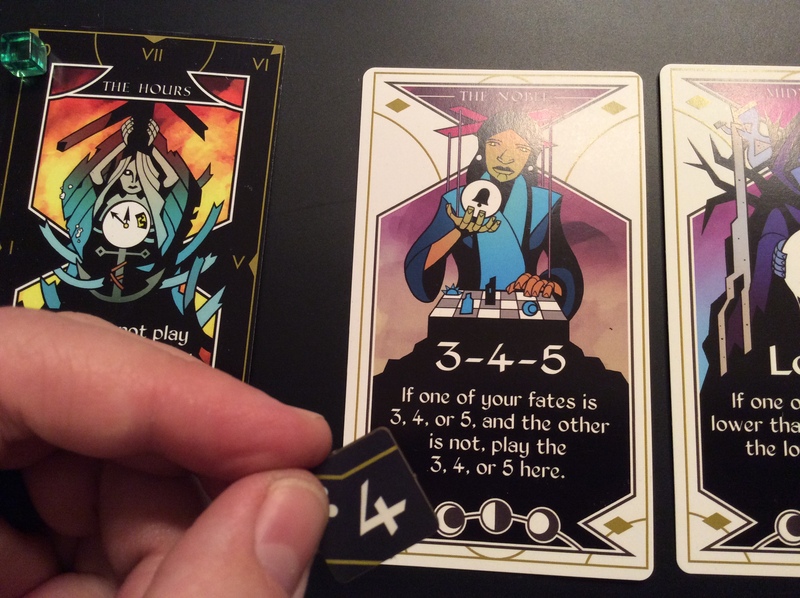 We actually cannot play either of our fates on any of the cards- so we have to play a fate on the Hours card – we choose to play the 1 so that we can continue to build on the information from the previous round. This doesn’t tell our team much but they are able to eliminate the 5 since 5+1 is a multiple of three and we weren’t able to play on the Belltower card. 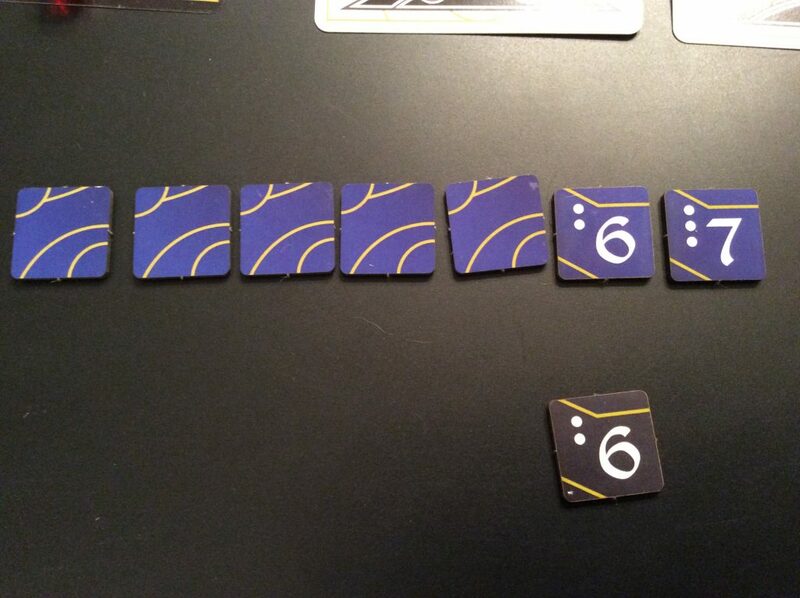 The other player now draws a 5 fate Token. Huzzah we can play the 5 on the Beast since 5 and 6 are exactly one more or less than each other. The team can now deduce that this player either has a 4 or a 6, but it’s a 50/50 guess. 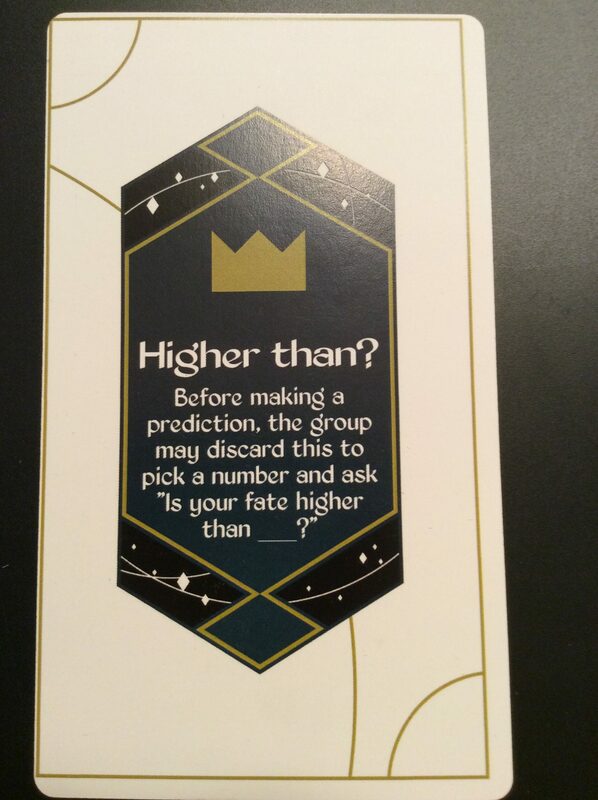 So the team decides to use the “Higher than?” Power that we received earlier. They ask is your fate higher than a 5? The answer is Yes and so the team guesses “6”. They get it right and this is good since the Beast only takes one hour symbol to Fade. But…since we correctly identified a Fate on the same turn that it Faded, we don’t have to move the Doom tracker, and we will get the special power on the back of the Beast. Also because we correctly identified a Fate, we move the Score Tracker Token to 1 -a step in the right direction. We reset the guess tokens and next turn this player will draw two Fate tokens. We also draw a new card and get the Stranger. 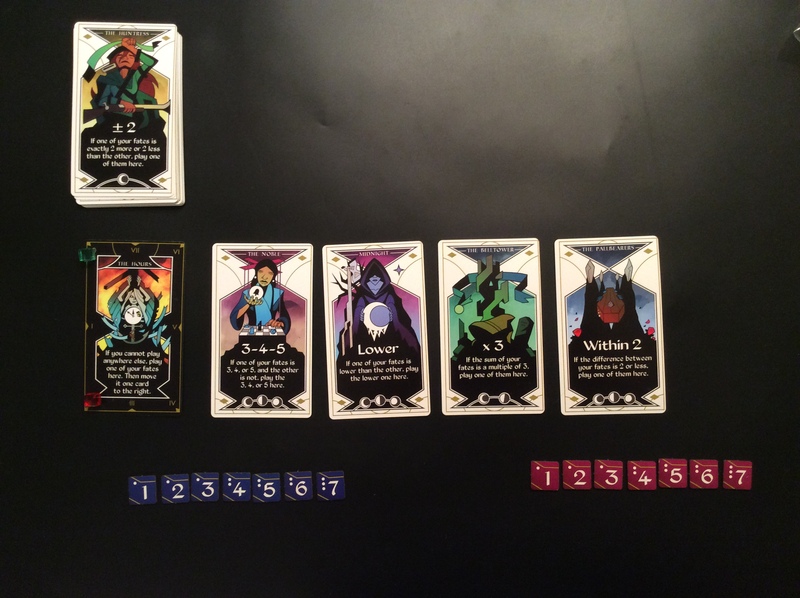 The first player now draws a 4 which can be played on the PallBearers (within 2) card. 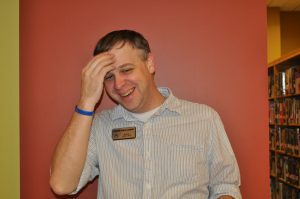 Our team guesses 6 and once again they get it right and move the Score Tracker Token towards victory. 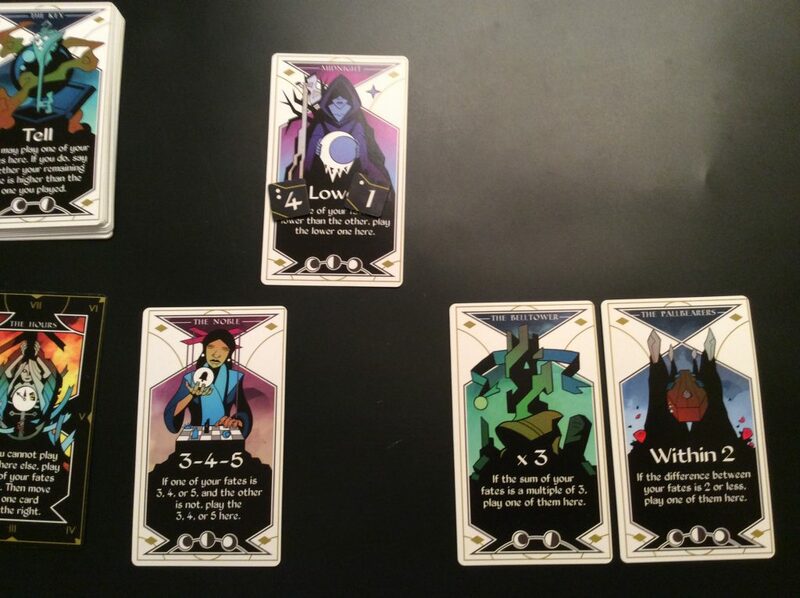 The game continues this way until your team either guesses 7 fates ( a Win) or the Doom Token gets to 7 first (a Loss). Each time you play Shipwreck Arcana it will be a new game. You could eventually know the cards so well that it becomes an exercise in memory, but that is unlikely to happen given the number of cards available. The game can also seem rather challenging or rather easy simply dependent on which cards and Fate tokens are drawn, so there is a tiny bit of luck thrown in as well, but most of the time, you can always play a Fate tile, so that at least a little information is conveyed. After playing it only a handful of times, I started to get the hang of the way certain cards worked, and to be happy to see them. 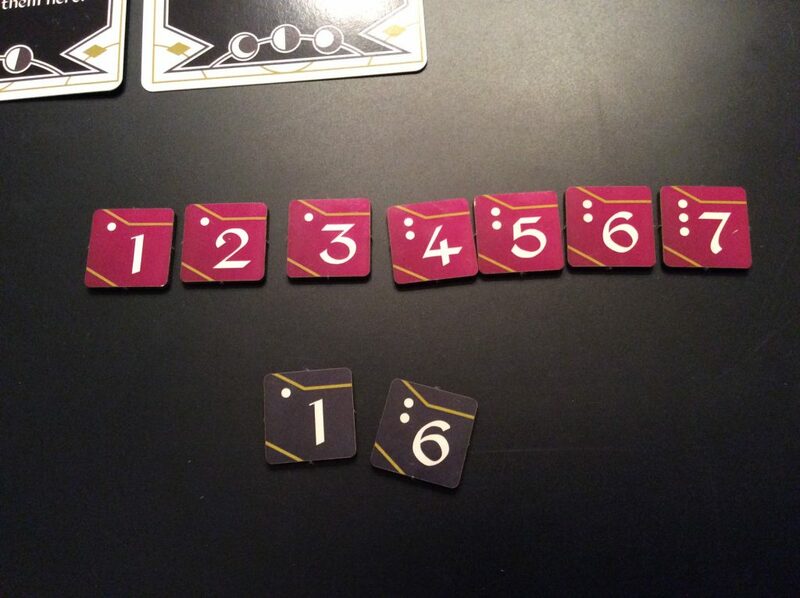 I also started to make sure I was Fading a card only on the turn we guess a Fate correctly (when at all possible). I have always enjoyed logic puzzles and so I really was drawn to the mechanics and the gameplay of this game. I wasn’t quite as drawn to the theme, but it didn’t really bother me either. The Arcane aspect certainly blends in nicely with the Tarot cards and their special powers, and the gameplay more than makes up for any difficulty I personally had in getting into the backstory. The artwork is pretty fantastic, and the gameplay is really top notch. Trying to deduce both what the active player is quickly showing you and then all of the things they are trying to imply based on their decisions, is a absolute joy. I really enjoyed both giving clues and guessing them, although it was really tough to remain absolutely quiet when it was my turn to give information, especially if the other players were headed in the wrong direction. Also it is an extremely compact game. Everything fits in the drawstring bag, which makes it really easy to take with you anywhere and get into gameplay quickly. There are also rules for having someone jump in mid game and for allowing someone to leave mid game so that you don’t have to quit and start over, which is great. If you enjoy deduction games at all, you have to try this game. It’s fast, easy to learn, but packs quite a lot of game into a tiny package. Ninja approved! Shipwreck Arcana was sent to us as part of the Everything Board Games Network in exchange for an honest review, which is what we provided. On KICKSTARTER between now and August 31, 2017.